A knight was a professional heavy cavalry soldier in the Middle Ages. They were the top soldiers to the kingdom, and protected it at all costs. Knights worked for lords or nobles, who in exchange would give them land if the knight would fight for them. Knights thought honour was very important, and they had a code of honour called chivalry. They always had a coat of arms, also called a crest. Knights of the Commonwealth Realms today are named by the Sovereign One of the British orders of knighthood is known as the Order of the British Empire. These knights today are called 'Sir' and then their first name. Many members of nobility are descended from knights. For example: Wijerd Jelckama descended from a knight who died at the siege of Antioch (1199). Knights were first used in the 4th century in the late Roman armies. The era of the knights ended in the 16th century as national armies replaced feudal armies. Many knights were recruited as officers in the new armies. Today's officer corps in Western armies began as groups of knights. Although knights no longer fight as elite warriors, the act of knighting, or being given knighthood by a king or queen, still exists. 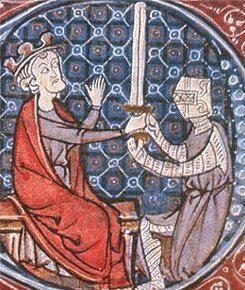 The most well-known example of knighting today are tapping the shoulders of the person being knighted with the flat side of a sword. People who are alive today who have been given knighthood include Sean Connery, Bill Gates, Clint Eastwood, Michael Caine, and former U.S. president George H.W. Bush. ↑ "33 Famous People Who Have Been Knighted". This page was last changed on 7 March 2018, at 10:34.